I use Lemongrass a lot. It numbs the nerves and helps relieve pain. I had untreated whiplash several times as a child in addition to a broken pelvic bone from a horse flipping over on top of me. I experience pain almost constantly. Lavender oil helps relax the muscles but the Lemongrass essential oil really helps with the pain. Unfortunately I still end up taking some ibuprofen all too often. I keep lemongrass near me on the couch, next to my bed, in the medicine cabinet, and by the table. Be careful with this oil though. It can burn sensitive skin. I use it directly but most people will probably need to dilute it with olive or almond oil. Essential oils can cause chemical burn. Lemongrass can also be used as a tea. It has a wonderful lemony taste. Lemongrass is also a bug deterrent. I mix it with citronella, tea tree oil, and apple cider vinegar for a homemade bug spray. 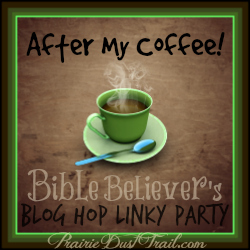 This is my last week to host After My Coffee linkup, at least for summer. I have a busy summer ahead and want to concentrate more on our home and family. Thank you all for participating. I'll still be posting about herbs and such, Lord willing. Have a wonderful summer!